Detectives in Tampa, Florida, are searching for the person responsible for killing three people in the span of 11 days. Tampa Police Chief Brian Dugan told WFTV that the incidents were possibly related. “This is my worst nightmare,” he said. 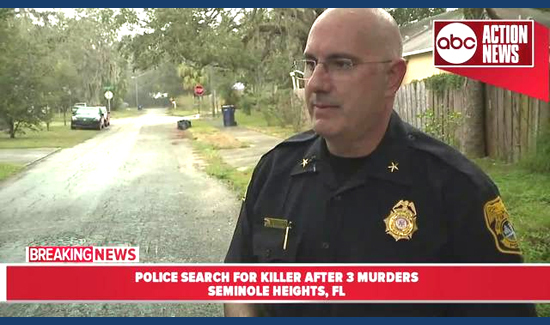 The killings all occurred in the Seminole Heights section of Tampa. The three victims do not have an apparent link to each other, but they were fatally shot within a half mile of each other. Amid fears of more deaths, police are now escorting children to school bus stops in the morning, according to the Tampa Bay Times. Officers received a list of neighborhood bus stops and pick-up times from the Tampa Police Department on Monday to watch out over students. They will also be watching over students who walk to school. “We didn’t want anybody walking by themselves to the bus at 6:10 a.m. without somebody nearby,” department spokesman Steve Hegarty told the Times. Two days later, Monica Caridad Hoffa, 32, was shot and killed ten blocks away. Her body was found in a grassy plot of land owned by the city of Tampa. “Her life was taken from her with no motive,” her family wrote in an online obituary.